Precious Moments | Badudets Everything Nice! When you’re in Aklan for your Boracay trip and you have time to spare, visiting Jojo’s Christmas Cottage at Sampaguita Gardens in New Washington, Aklan is well worth it. It’s a 10-minute ride from the Kalibo Airport. The highlight inside the Sampaguita Gardens is Jojo’s Christmas Cottage. In here, the motto is “Everyday is Christmas”. The cottage had its share of media exposures and was featured on some of TV shows like Rated K. The cottage houses “Precious Moments” doll collections and various Christmas trees in all forms, themes and sizes. Souvenir items like handicrafts, T-shirts, trinkets and other Precious Moments knick-knacks are sold here. 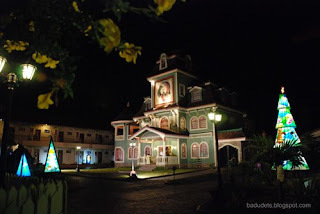 Sampaguita Gardens is sort-of a Mini-Disneyland of Aklan in my opinion. It also has a Thai Spa, Thai-inspired Mr. Butcher’s House, hotel, butterfly garden, coffee shop, function hall and the Oriental Flavors Restaurant for your fine dining experience. 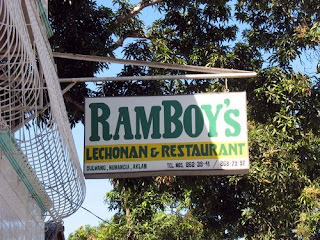 To taste the best Lechon Manok in Aklan, go to Ramboy’s along the hi-way of Numancia, Aklan. For Caticlan-bound visitors, you can’t miss this place since public transportation always pass this route. 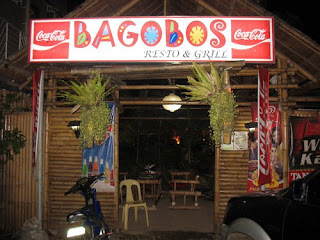 Just beside Ramboy’s is another restaurant called Bagobos. We had our dinner at this place on our first day. We ordered Crispy Pata and Sisig, the Crispy Pata is delicious. But service is really really slow, I’m warning you not to eat here if you’re looking for a quick bite.